The other day we mentioned the potential reduction of hours at the Beacon Hill library. The reduction in hours would have the library closing entirely on Fridays and Sundays, and closing early on other days. The Friends of the Seattle Public Library blog has a post that clearly explains what you can do to help fight these changes, including attending public hearings (starting tonight), and contacting city councilmembers. Some Friends of the Library were at the Beacon Hill Library on Sunday handing out information about the closures and talking to patrons. October is International Walk to School Month, and local non-profit organization Feet First is observing the event by forming “walking school buses” at Muir Elementary School on “Walking Wednesdays.” Families, students and teachers will meet at designated locations and walk together to school. Walking groups leave at 8:40 a.m. from Safeway’s parking lot (behind Silver Fork), 33rd Avenue and Bayview (north of McClellan), Hunter Boulevard and South Hanford, and the Mt. 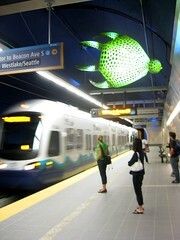 Baker light rail station. We hear that Yoga On Beacon, at 3013 Beacon Ave South, is two years old as of October 1st. Happy birthday! 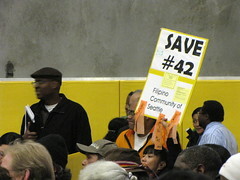 People came to last week's County Council Town Hall Meeting to protest recent bus route changes. Photo by Wendi. The King County Council Town Hall YouTube channel has posted video from last week’s public transit town hall meeting at the Rainier Vista Boys and Girls Club — unfortunately, the video’s just a one-minute collage with music and not very much context, and doesn’t give more than a hint of what the event was really like, or of the anger expressed by many Southeast Seattle residents who spoke that evening about the way recent bus route changes have affected their lives. Update: Al Sanders and Frank Abe from the Council pointed us to the full video of the meeting now available on their website as of this morning. Thanks guys! Mayoral candidate Mike McGinn is hosting a town hall meeting tomorrow (Saturday, October 3) on South Beacon Hill. The location is the Van Asselt Community Center, 2821 South Myrtle Street. The town hall meeting starts at 3:00 pm. Quite nearby is another event, the Mid-Autumn Festival of Lights (Trung Thu) at John C. Little Park, 6961 37th Avenue South. This event is free, and includes moon cakes, storytelling, lanterns, face painting, and more celebratory fun. It’s from 6:00-9:00 pm, so you can easily attend both events. Do you have something to say about light rail's effect on local transit? The County Council's Town Hall meeting next week is the place to be. Photo by Joel Lee in the Beacon Hill Blog photo pool on Flickr. The next Town Hall Meeting of the Metropolitan King County Council will be here in Southeast Seattle, and will focus on the impact light rail will have on the regional transit system, and the fiscal challenges facing Metro Transit. The meeting will be next Wednesday, September 30, at the Rainier Vista Boys and Girls Club, 4520 Martin Luther King Jr. Way South. The site is only one block north of Columbia City Station. The public is invited to meet with Councilmembers at an informal reception starting at 6:00 p.m. The Town Hall will begin at 6:30 p.m.
Further info is on kingcounty.gov. A set of bagpipes have gone missing on Beacon Hill, taken from a curb. Have you seen them? There is a $400 reward for their safe return. The Green City Partnerships blog has a story about Andrea Ostrovsky and Mary DeJong, who have worked hard to improve the Cheasty Greenspace over the last couple of years, including hosting community work parties in Cheasty on the first Saturday of every month. In Ostrovsky and DeJong’s vision, the Greenspace is “a potential link between Beacon Hill’s Lockmore neighborhood and Columbia City,” among other things. You could grow these on your own tree, free from EarthCorps and the Mayor's Office of Sustainability and the Environment. Photo by Erlomo. More free trees! EarthCorps and the Mayor’s Office of Sustainability and the Environment are looking to provide trees to residents to plant on private property or the planting/parking strips along the street in neighborhoods with low tree canopy coverage. 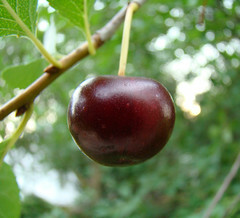 There are several trees to choose from, including cherry trees. Check the EarthCorps site for more info and the application form. Craig Thompson takes KOMO’s Travis Mayfield for a walk in the Jungle. Video, too. And more at Travis’s personal blog. You can post your own garage sale announcements in our Forum. The Chrysanthemum Literary Society’s inaugural poetry reading is this Saturday, the 19th, from 10:30am to 12:30pm at the Beacon Hill library. Don’t forget the other events coming up — like the Lucile Street block party this Saturday starting at noon! Check out the event calendar for more.